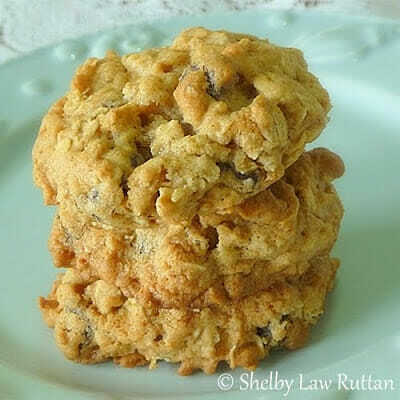 These chewy Oatmeal Raisin Cookies are Grumpy’s favorite cookies ever. Therefore, when I am baking cookies, he always will ask me if they are Oatmeal Raisin and if they aren’t are the cookies chewy! Gotta love that Grumpy. The day I made these started out terribly in the kitchen. First thing that happened was I made an egg breakfast recipe that was a total flop. It came out pretty, but tasted terrible. Next, I decided to go ahead and make the granola I had been thinking about for weeks now; and I burned it beyond recognition. The last thing I did wasn’t as terrible – but it turned out that I ended up with a lot of bread dough – because without thinking I started to make my mom’s recipe for Potato Rolls and ended up with enough dough to make 3 loaves of bread. Not planned at all but once the wet ingredients were mixed there was no going back. I don’t know where my mind was yesterday morning. 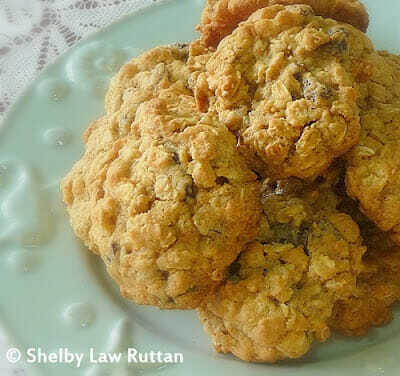 So, needless to say when I made these cookies I had an apprehension that I would mess up – and I did but only on baking the last 3 that I couldn’t fit on my cookie sheet with the last full batch. I totally forgot I had them in the oven and they got way too dark. My mind just totally was not with me in the morning whatsoever. I even told my hairdresser I could make a 1:30 appointment without even remembering that I had the bread dough rising. Fortunately I made it to the appointment, but not without a minute to spare. I guess its a good thing that she is only 5 minutes away from me! I also followed this recipe to a T for two reasons. Its the recipe that Grumpy likes and you don’t mess with something that he likes as is and secondly I was scared that if I did make changes that I would mess the cookies up since my pattern that morning was to be a failure! Thankfully, the cookies that I didn’t burn turned out fabulous. 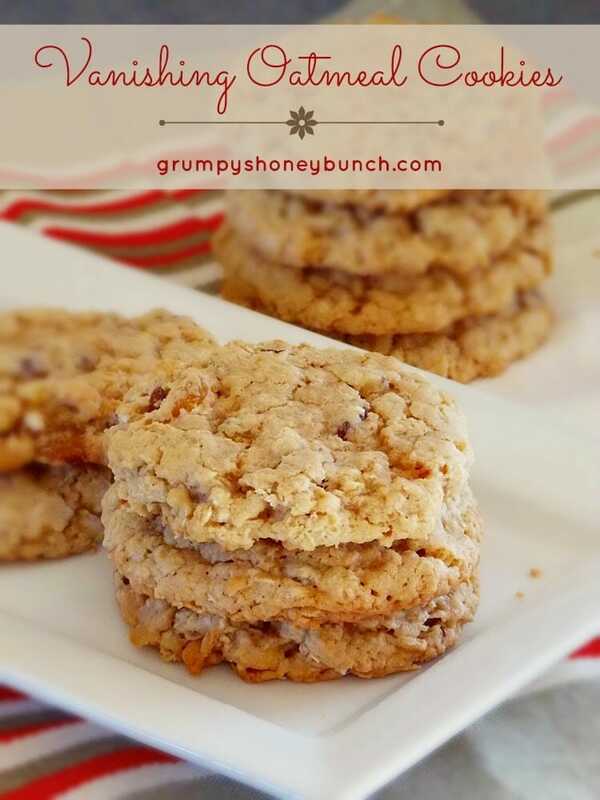 This is Grumpy’s favorite cookie ever and the recipe is right off the Quaker Whole Oats Oatmeal box. If you have never made this recipe you should. They are not crunchy (which is why they are Grumpy’s favorite) and the raisins give them a chewiness that I love! 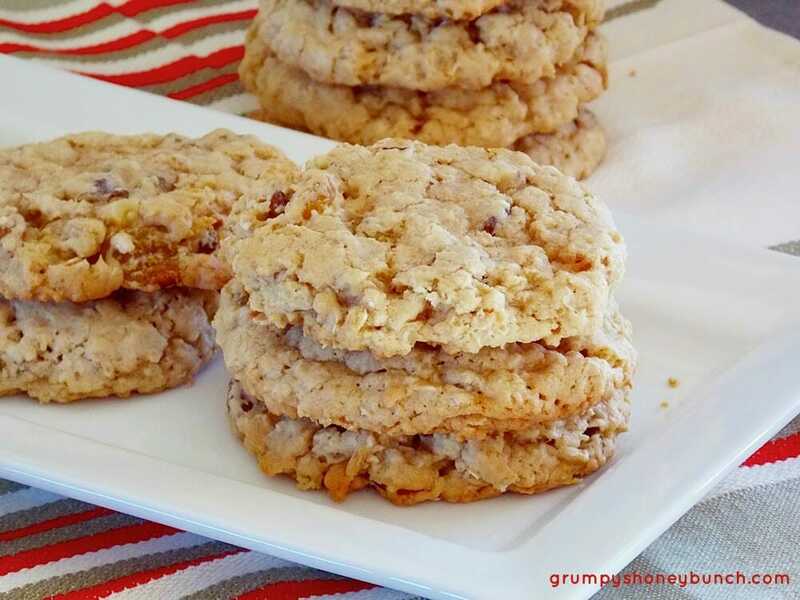 recipe from the Quaker Oats box, sometimes you just don’t mess with perfection! Heat oven to 350 degrees. In large bowl, beat butter and sugars on medium speed with an electric mixer until creamy.Add eggs and vanilla; beat well.Add combined flour, baking soda, cinnamon and salt; mix well. Drop by rounded tablespoons onto cookie sheet lined with parchment paper. Bake 8-10 minutes or until light golden brown. Cool on wire rack.The prep and cook time includes baking ALL batches of cookies and are an estimate as all ovens are different. Please use your own judgement when baking the cookies and watch them carefully. 🙂 They have already disappeared here! I took them over to our neighbors last evening where we all sat outside visiting and eating cookies! ha! I have always loved these cookies. I'm sorry your day was full of cooking problems. Thanks for sharing your recipes. Its a better day today Peggy! 🙂 I guess everyone has their days and yesterday was certainly one of those days for me! wow those look great! love the photo on twitpics… reposted it twice lol great shot! I've made these cookies and they really are perfect as is! Sorry to hear you had a rough cooking day… but, keep in mind we've all had them and once the day is gone, we are back to what we do best! I do love oatmeal cookies so! Especially chewy ones fresh from the oven. This post brings back childhood memories thanks so much for sharing! I think we all have days like that in the kitchen. I feel ya. But boy do those cookies look yummy. I can see why Grumpy wants them! I do too.